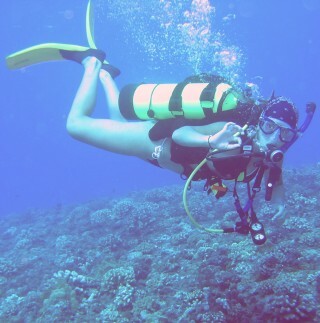 Amanda gives the OK sign on a dive in Tahiti. Playing underwater, either snorkeling or scuba diving, is one of our main recreations. In the tropics, the water is usually deliciously warm, the corals are vibrant, and the fish are nothing short of fantastic. The main exception to this that we've seen was the Galapagos, where the Humboldt Current comes up from Antarctica, so the waters are cold enough to require wet-suits (even for snorkeling) and there are few, if any, corals. The dive sites we've highlighted here are those that we found either on our own (often with other cruisers) or through the aid of a dive guide or advice of a local dive shop. This is certainly not a comprehensive list of all the fantastic dive sites available on these (and other) islands! It's just where we went. We also haven't included all of the places we've dived - who wants to hear about how we helped clean a ton of refuse off the bottom of Neiafu harbor in Tonga, or how Jon had to search for Sue's wallet on the yucky bottom of Suva harbor? (Yes, he found it! Thank goodness for the Search and Recovery training he got for his Advanced Diving certificate in Tonga). But we have included the majority of our dives. Folks reading this should also realize that we don't have a dive-compressor on board, so we're restricted to getting fills from other yachts (for all of our Tuamotus and Indonesia dives) or going back to 'civilization' to get our tanks filled at a dive shop. Dive compressors are bulky, heavy, expensive, and take a fair amount of maintenance. They also have voracious energy appetites. While fills in Tahiti were relatively expensive (US$11) other places were much more reasonable ($2-5) and we've usually been able to get fills whenever we needed them. Safe Diving: If you're trying to follow our bubbles, be sure you're certified, have good equipment and adequate surface support. Conditions change rapidly with tide, moon phase, swell, rain, and other weather factors, so what we found at one site may not be at all the same for other divers at other times. It never hurts to seek the advice of locals before diving, and always practice safe diving! for organizing a dive trip to French Polynesia. Much is in French. Official site of the GIE Diving of Tahiti.